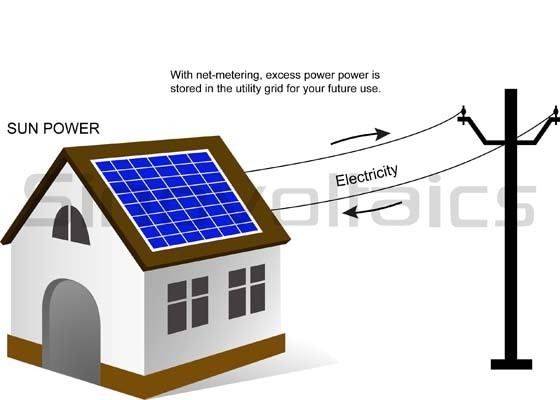 Net metering allows you to sell excess power produced by your solar system back to the utility grid company at an agreed price. Does my kwh meter really spins backwards? Yes, when a solar power system generates more power than your home or business can directly use, the excess power is fed back to the grid and your kwh meter will literally spin backwards. Of course when using more power than the solar power system generates, the kwh meter will run forward as usual. For net metering there needs to be an agreement with the utility company. Such a metering and billing agreement is signed between the owner of the solar system and the utility company. Usually the energy is traded between both parties in the form of electric credits. Most utility companies credit you for the extra power that your solar installation produced. Not all utility companies will send a cheque to their users for their excess power generated. Be sure to study the possibilities in detail before installing a system which is expected to produce more power than your actual use. Do I need any special equipment for net metering? Some utility companies require you to install an additional meter for net metering. However most of the times, any kwh meter will do. It’s the agreement between the utility company and the owner of the solar installation that is most important. Time-of-Use (TOU) rates is a term often used to refer to a grid billing system in which the price of electricity depends on the hour of the day. For instance rates can be lower in the evening, while rates are highest in the afternoon when usage is at its ‘peak’. When are the common Partial-peak hours? In most countries, the “Partial-peak” hours are in the morning and early evening, while “off-peak” hours are usually during the night and on weekends. As the peak hours are usually during the day, net metering helps to smoothen the demand curve for electricity and it helps utilities to manage the peak electricity loads. Finally a DE-centralized way of generating power also helps to reduce any strain on grid distribution and to avoid losses in electricity transmission.